In most real cases the problem of scheduling operations are sequence dependent, that is, the setup time depends on the sequencing of tasks/batches in the machine. Given the current industrial manufacturing trends and requirements such as high variability, customization and reduction of product life cycles, organizations seek to implement new methodologies to adapt and respond with more flexibly to new demands of the global markets. 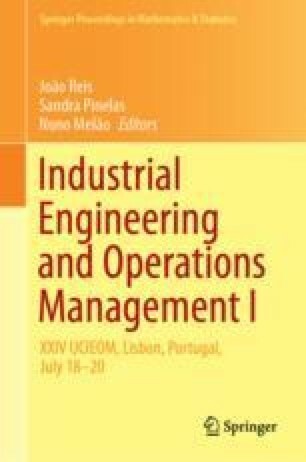 Thus, this work sought to analyse, inspired by a real case of the textile industry, how production scheduling can be understood as a complement to SMED in order to achieve productivity improvement. In the case under analysis we presented the problem of scheduling tasks in uniform parallel machines with sequence-dependent setup times. The main objective of this work was to minimize the total production time. To this goal, optimization heuristics were used, in this case, simulated annealing algorithm, that demonstrated how the use of heuristics can be an advantage to reduce setup times when associated with other methodologies such as SMED. This work has been supported by the project Centro-01-0145-FEDER-000017 - EMaDeS - Energy, Materials and Sustainable Development, co-financed by the Portugal 2020 Program (PT 2020), within the Regional Operational Program of the Center (CENTRO 2020) and the European Union through the European Regional Development Fund (ERDF).The authors wish to thank the opportunity and financial support that permitted to carry on this project. And C-MAST/Centre for Mechanical and Aerospace Science and Technologies. project UID/EMS /00151/2013 C-MAST, POCI-01-0145-FEDER-007718.